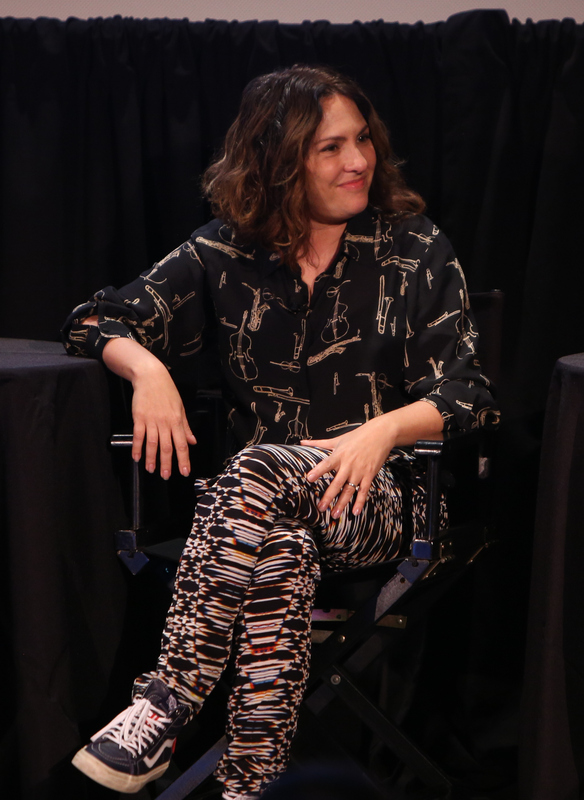 When it comes to LGBTQ representation in the media there are few people more at the forefront of the conversation than Transparent 's Jill Soloway and Orange Is the New Black 's Jenji Kohan. As the reigning era of the white male antihero takes its final bows as shows like Breaking Bad and Mad Men say their goodbyes, they are being replaced more and more with dynamic stories centered on less-frequently represented points of view — women, people of color, all the letters in LGTBQ, and a whole bunch of intersections therein. On Saturday, the "LGTB TV" panel at New Yorker Festival was the site of a discussin between Soloway and Kohan that we should really be paying attention to. At its heart lies questions that are crucial to the future of inclusive, representative television. There are at this point many pieces that lay out exactly what went down at the panel, but here's the gist: Soloway, created the show Transparent, which stars Jeffrey Tambor as a transgender woman. Prepping for the show's second season on Amazon Prime, Soloway sought out trans women to join the writing staff. When she couldn't find any, she decided to turn some trans women into TV writers: As Decider's Chad Kaydo put it, "Soloway is asking trans women who write in other media to send in short stories. She plans to help some writers develop sample scripts, and ultimately hire one for the second season." As Soloway herself put it, "We’re actually going to be helping make trans women TV writers by teaching them how to write." I think great writers should write great shows, and I have trouble with, like, what you are in life shouldn’t automatically make you what you do in your art. It doesn’t necessarily translate. [...] I would just never want to be told I can never write male characters. No matter what we did, we were always going to be otherizing Maura in some way. And in the same way where I wouldn’t want a man to say, ‘I can have a writers’ room full of men and we can write women just fine.’ I can’t say that I can create a show about a trans woman and not have a trans woman writing for me. It’s absolutely necessary, and it’s gonna change the show. As with any debate about diversity in media, it's tempting to take staunch sides here, calling out the other side for insensitivity or creative short-sightedness. But I'd caution against the take-away from this panel being centered on who "won" the dispute — if only because it's exactly this argument that lies at the center of the movement for more diversity in our media. Kohan's side is a familiar one: The protection of the creative, of an artist's right to tackle point of views that don't necessarily match their own. Shonda Rhimes isn't a white woman like Meredith Grey or a latino man like Scandal's Huck; Joss Whedon isn't a petite teenage girl like Buffy Summers; Jenji Kohan isn't a black trans inmate like Sophia Burset. The writing of characters outside the realm of the writers' personal experience is a tradition that's existed as long as writing itself has. Another long tradition, though, is the systematic shutting-out of certain communities and identities. Soloway's tactics are classic affirmative action: Trans television writers are a small or nonexistent population not because trans people have been disinterested in writing for television, but because trans people have faced obstacles every step of the way that make getting there almost impossible. It's an issue faced by all marginalized populations, and the results are written all over television both onscreen and behind the scenes. Not everyone starts on equal footing, so there's no shame in efforts to even things out a little bit. And to even things out onscreen, you've often got to drastically shake-up what's going on behind the camera. We live in an era where the calling-out of media entities that lack or mishandle diversity is common practice, and for good reason: It's frustrating that these are still battles we have to fight. But as we fight them, it's important to remember that this is the conversation that's happening in the background of it all. This is the conversation that's going to make the difference.